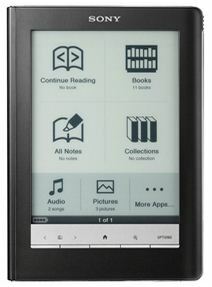 Knowing that I’ve been using a Sony eBook Reader for the past six months, a friend asked me whether I’m happy with it and would I recommend an eReader for personal use and as a gift. My answer: An unqualified YES. I’ve become totally enamored of my eBook reader. For the past six months, I’ve been using the Sony Touch (PRS 600) Reader (on SonyStyle.com; on SonyStyle.ca). It’s a touch sensitive reader that lets me turn the pages by swiping my finger on the screen. I can also highlight passages by double tapping and sweeping my finger across the text, write notes with a stylus or use the soft keyboard. And I can look up words in a built-in dictionary simply by double tapping on them. All fantastic. But also expensive at $300. And the screen treatment that makes it touch sensitive also dulls (slightly) the e-ink screen. Oh, and one more thing. At only about 10 oz., the Sony eReader is light enough to hold comfortably for a long reading session. This is a real advantage over the Apple iPad, which feels like a brick in comparison. My wife just bought a Kobo eReader – and I’ve decided that this is even more ideal for most people. You download the books by hooking the reader up to a computer – either via USB or Bluetooth (neat). It’s as light as the Sony and, at $149, a great value. I use the Kobo eBook store to purchase books and download them to both devices. It’s a great experience. Simple to purchase and download books. Kobo’s slogan is “eReading. Anytime. Any place.” And they seem determined to deliver on this promise. You never lose them! Once you’ve purchased the books, they’re always in your online Kobo Library. So, if you break or replace your hardware reader, you can simply download your books to a new reader. One great thing about both the Sony and Kobo eReaders is that they let you magnify the size of the text on the screen. Thanks to Adobe’s ePub software, the words rearrange themselves in an uninterrupted flow on the screen, regardless of whether you use the smallest or the largest font size. I use this feature a lot late at night when my eyes are tired. And I can’t imagine going back to having to squint at small print on a physical book page. So, Yes, I would wholeheartedly recommend an eReader – and I’d suggest that you take a look at both the Sony and Kobo eReaders. And once you have it, do take a look at the Kobo book store. I use it and I love it.